It will help you to QUICKLY improve your Classical Guitar skills! Take Action Now - While It's Fr/ee! 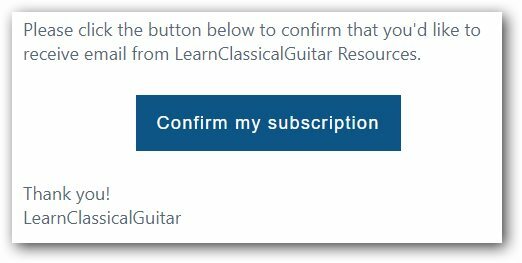 Get the 'Classical Guitar PDF Bundle' of great pieces in both music notation & TAB just for joining the LearnClassicalGuitar Resources newsletter. Whether you're a beginner, or have some experience playing classical guitar, the regular sheet music in both notation & TAB will improve your skills and technique QUICKLY ! 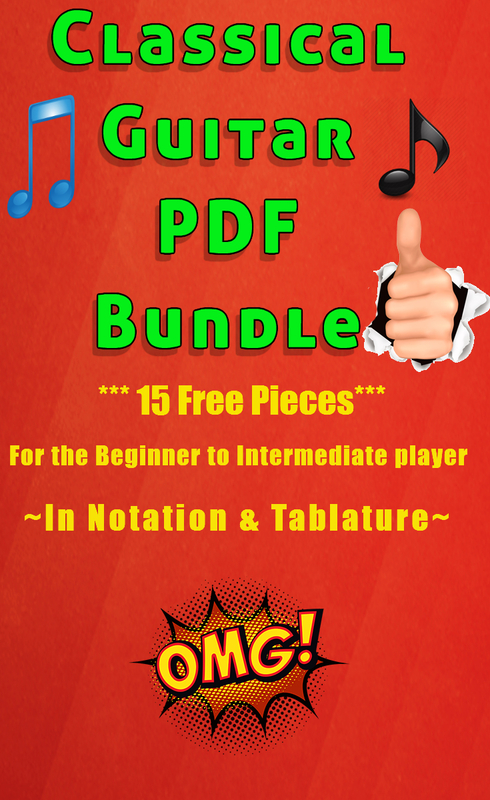 Download Your PDF Bundle Now! "LearnClassicalGuitar.com is a wonderful website for the classical guitar player. The videos help me to know how the music should sound and helps me get the timing right because sometimes the time signatures in classical music can be confusing to figure out. The website offers a wide variety of classical music that I may not otherwise be able to experience. For someone like me, on a limited budget, finding classical music to play can be a hard thing to do. LearnClassicalGuitar.com has given me the opportunity and the motivation to pick up my guitar and learn new things. Thank you Trevor, for providing this website for us!!!" "This is truly a great site for learning classical guitar, and probably one of the best on the web! Practice lessons are well thought out, and the videos are totally amazing to enhance your learning experience. Monthly Ezine news letters are always pleasant to receive and give you a real sense about the author's dedication to the education of classical guitar worldwide. As a medical student, I have a serious lack of time, and this site really helps me to be more effective with quality exercise sessions for short periods of time. This actually means that I was able to find a way to practice more often and progress faster. 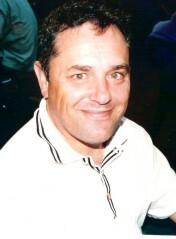 Thanks a lot Trevor and I very much appreciate your great site"
"Wow, what a great website. I want to give you my thanks. I love the way it is set up. I especially appreciate the videos that go along with the lessons. You get the sense of what you are attempting to do, and how it is sounds. Being able to go back to the passages you are struggling with is a big plus. This site has brought back my enthusiasm for learning classical playing. I highly recommend anyone new or intermediate to this site. Thank you." "I am truly thrilled to have recently "stumbled" onto your web site and ezine! As a totally novice guitarist, it is wonderful for me to watch the economy in your playing. Thanks, so much, for providing this INVALUABLE resource to the classical community." "LearnClassicalGuitar.com is directly responsible for increasing the depth of my repertoire. Where I live, there are no classical guitar instructors below the University level. This site has remedied this for me...I look forward to the newsletter each month and direct aspiring classical guitarists to this site with no hesitation." "Learn Classical Guitar and Great Guitar Tips (Ezine) are a wonderful free resource for all players at all levels. Not only are there clear notations and tablatures but good quality video. Best of all...it is free of charge. Everyone can learn something here from beginner to advanced, regardless of styles of music you play. This is not just a site for classical players. I have enjoyed and continue to enjoy the pieces and the extra info. Thanks a lot!" "I discovered your site about five months ago. I'm a 65-year-old who, after 24 years away from it, has taken up classical again. There are many resources on the internet, and yours is one of the best. It's well organized, straight-forward, easy to navigate, and full of wonderful stuff. You present a very good and varied selection of pieces. They're explained well, and the videos are extremely helpful. Being a retiree on a fixed income, I'm probably not going to spring for lessons, but what's on your site is a great alternative. I also enjoy getting your monthly newsletter...One great suggestion you give is to get "Pumping Nylon" by Scott Tennant. That book (with the DVD) is a revelation! My left hand has improved far beyond what I'd ever hoped for after going through those exercises! I really appreciate your good work!" "Trevor your site is an inspiration, well constructed and easy to navigate. I have used the music featured and your own video versions as a teaching aid and find that with a little practice along with several viewings I have been very pleased with the progress I've made. Please keep this site alive, I have yet to master all the contents. In one word.....BRILLIANT!"